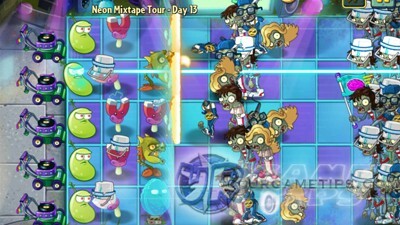 Here's the 1st part of the quick walkthrough and strategy guide for the "Neon Mixtape Tour" stages in the strategy defense game - Plants vs. Zombies 2: It's About Time! Stock up on hairspray and rewind to the 1980s! - Play Lost City Quick Walkthrough and Strategy Guide first before this guide! 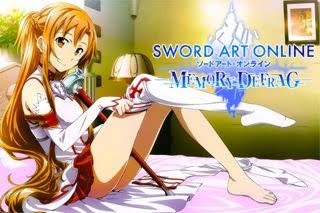 - Attacks a 3x3 square from their position, with nice attack speed and cool-down too. - Another cool plant, fires piercing attacks, then hides and does ground damage when zombies are near. Even better when PF is used, giving them extra damages. - Hides, and attacks zombies from behind. Needs an empty tile before it though to attack, and it's not good vs group of zombies. - Sends all zombies back from where that came from, single use. - Support: Cherry Bomb, Chili Bean, and Stallia. - Setup Snapdragons and some Magnet-shrooms, then Walls and Endurains. Add more Magnets, then Phat Beets last. - Magnet-shrooms are very effective against those Punk zombies. - PF: Any or to recharge your worn out Chard Guards. - Support: Stallia to stall a large group of zombies. - Setup Snapdragons and some Magnet-shrooms, then Walls and Endurains. Add more Magnets and Spikeweeds next. - Support: Stallia, helps your Snapdragons defeat zombies early on, before you can setup your Walls. - Follow these steps in-order, and do not use the Speed Booster for now. - Ignore the 2 Wall-Nuts, and just focus on the 2 Phat Beets. - Sunflower: Plant them on the far left side as usual, start planting 3 of them from the start. Continue planting while doing the steps below. - Stallia: Spam from the start to support your plants. - Snapdragons: Put your first 2 at the back of those 2 Phat Beets to support them. - Wall and Endurian: Place your first 2 in front of those 2 Phat Beets to protect them. - Magnet-shrooms: Spam them at the back of your Snapdragons, fill up that column fast. Drag and drop your PF into your Magnet Shroom's seed packet to instantly let it cool-down. - Cherry Bomb: Use for clearing heavy zombie mobs. - In case your Walls and Endurians gets kicked-off, just replace them. - Just replace fallen plants, or spam them all on the next columns. - PF: Sunflower to get more Sun. - Plant 3 Sunflowers and turn off speed booster. - Cherry Bomb: Use this to defeat those first 2 Cone Zombies, use the PF to your Sunflower. - Continue and complete your Kernel-pults and 3rd column Snapdragons. - Support: Stallia to help your Snapdragons defeat zombies, and Cherry Bombs to clear heavy mobs. - PF: Sunflower for more Sun early on, then use on any plant later. - Start by planting 3 Sunflowers and 1 Magnet-shroom, then complete the Sunflower column. - Plant Snapdragons and Phat Beets on the 3 center rows first, then complete Snapdragons. Watch out for the next 2 Glitter zombies (top and bottom lanes), use Cherry Bomb and Stallia if needed. - Support: Spam Stallia to help your Snapdragons and Phat Beets, use Cherry Bomb if needed. - Make sure you have enough Magnet-shrooms before the waves of Punk Zombies comes in. - Spikeweeds: Place them last to help eliminate those Glitter zombies, add more if you like. - PF: Sunflower for more Sun. - The trick is to plant fast, anticipate where zombies will come from. 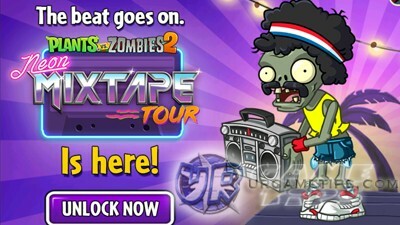 - Support: Iceberg Lettuce and Stunion to stall early punk zombies and group of zombies. - Start by placing Peashooters (2nd column first) and Phat Beet, let the Punk zombies kick the Sunflowers. - If there are at least 3 or 4 Sunflowers on the 1st column, you can use your Shovel to remove other Sunflowers on other columns. - After the formation, add in Celery plants on the 6th Column. Replace fallen plants. - Support: Thyme Warp, use if zombies reached the 1st or 2nd column, but reserve some for the group of Cone and Bucket zombies later on. Once Spikerocks starts to roll in, let them deal damages, then use Thyme Warp once they reach your Phat Beets. - Go and plant 5 Sunflowers early on, use Stallia to stall zombies. Focus your Threepeaters on the 2nd, 3rd, and 4th rows first, no need to place them on the 1st and 5th rows. - Potato Mine: vs Bucket zombies. - Cherry Bomb vs group of zombies. - Thyme Warp: If your zombies attack your 2nd or 3rd column. - PF: After using Cherry Bomb on the Gargantuar, drag and drop your PF to your Cherry Bomb's seed packet to use it again. - Go and plant 5 Sunflowers early on, use Stallia to stall zombies. Place your first 2 Snapdragons on the 2nd and 4th rows, then complete Kernel-pults. Kernel-pults are very effective against those zombies holding microphones (MC Zom-B). - Magnet-shroom: Just place 1 at the center of the 3rd column to help defeat tough zombies. - Refer to the formation below, then just watch till the end. - PF: Infi-Nut to bring up shield. - PF: Cactus, turn all 2nd column Cactus plants to a nastier one. - Start planting 5 Sunflowers early on, use Stallia to stall zombies. Next, quickly plant 1 Snapdragon and 1 Magnet-shroom to take care of the first few zombies. - PF: Sunflower, quickly use and gather. - Cherry Bomb and Chili Bean: Use it on the first 2 Cone zombies, usually comes in at the top and bottom rows. This will let you setup more Snapdragons and Magnet-shrooms. - Laser Bean: Can really tear through the zombies, set them up after setting up 3 Snapdragons and Magnet-shrooms on the 3 center rows. - Support: Spam Stallia, and use Cherry Bomb and Chili Bean to destroy groups of zombies. - Add in more Snapdragons and Magnet-shrooms if you like. - *You can also use Kernel-Pults as alternative to Laser Beans. - How to Defeat the Gargantuars? - Use PF on Kernel-pult to stun them, then plant Celery Stalkers, at the back of those Gargantuars to attack them from behind. To make them stay even longer, use Stallia. - Just use 1 column for Celery Stalkers, reserve the other for Gargantuars. - Support: Stallia to stall enemies and use Thyme Warp if needed. - Just continue and replace fallen plants, should be easy. - The 2nd Part of the Neon Mixtape Tour is now available HERE.